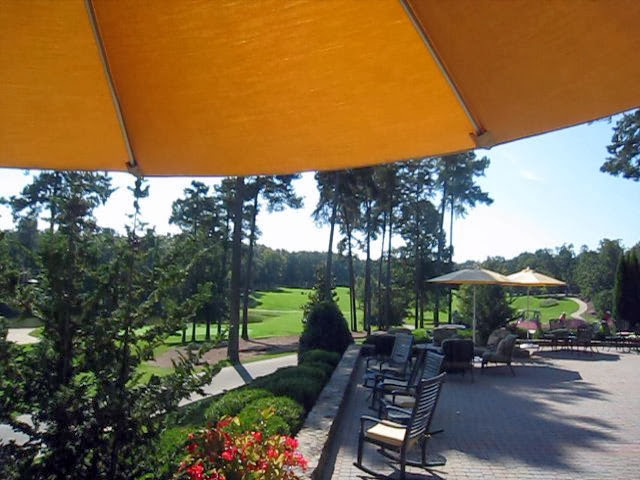 Hi, I’m Marianne Howell Wright and I want to show you around Governors Club, Chapel Hill, NC gated golf neighborhood and give you information about the homes for sale with informal photos and videos of the homes and neighborhood that will help show you what Governors Club is really like. Governors Club has over 800 homes with prices ranging from the mid 400′s to the millions. With over 800 homes and lots of topography it made sense to have different neighborhoods and price ranges in Governors Club. First developed in the 80’s the neighborhood has had spurts of building in the 90’s and then again from 2000 to around 2009. Builders snapped up the easiest lots to build on. If you like a mountain view or terrain and are up to the challenge of a difficult lot there is a good choice. As you drive through the gates of Governors Club past the guard house the homes you pass will be part of The Estates community of Governors Club. Estate home sites are scattered in sections through out the neighborhood. Homes in the estates were built by various custom builders and have a variety of styles, finishes, floor plans and exteriors. If you traveling down Governors Drive and take the first right turn on Manly and go off to the right on Eastchurch past estate homes you will find the Saddle Ridge area. Lots in this area are around 1/2 to 3/4 acre and are located on cul de sacs. Some of these home sites are fairly steep both up and down. Great views and a challenge for building! If you hate yard work and want a golf course view you may want to consider Governors Square. The small 1/4 homesites feel larger because of the site planning and views out the back. The home sites are level and the plans have a similar look and feel. There are additional HOA dues because of the yard maintenance. Along with Governors Square Tryon Court has it’s own association with dues required for the yard maintenance. The home sites are slightly larger than Governors Square and there are more traditional 2 story plans. Going on down the road we can take a turn off to the left on Morehead. Walker Falls is off to the right and the 1/4 to 1/2 acre lots have golf course or lake views. The lots are flat and yard maintenance is included. There are additional HOA dues for this service. Adjacent to Walker Falls Is Morehead Forest. It’s one of the largest neighborhoods in Governors Club. Some homes have golf or lake views. The prices are great for the neighborhood, ranging from the upper 400′s. This area is popular because the homesites are level and there are sidewalks for walking. The top of the mountain! These homes have awesome views. You can see for miles. Homes are over two million dollars and go way up from there. The lots are exceptionally large ranging from 2 to 3.5 acres. Stone Brook has beautiful rolling wooded topography with homes made of natural materials like cedar, stone and copper. The style is often described as French country. Stone Brook has it own neighborhood amenities including a pool, tennis, playground, pavilion, tennis and scenic waterfall. The homes are all a variation of a few plans so the community has a cohesive look. Some people love it and others prefer the more varied look of other Governors club neighborhoods. There are additional HOA dues for this neighborhood. The Vance Villas started out as townhomes but as time went on they didn’t sell as well as the single family homes. They were also stucco whick was a drawback. Today the remaining homes sites are being developed with single family homes. This is a great location in the neighborhood right across the street from the Club. In Lunch on the Terrace below I show a video of my actual clients viewing the club amenities because the lifestyle of the neighborhood was as important to them as the homes we viewed. It turned exactly as they had hoped and they then went on to find the perfect home for them. The Property Owners Association in Governors Club plays a big part in keeping the neighborhood so attractive and a beautiful place to live. Today I’m taking you on a video tour of the Governors Club neighborhood amenities and having lunch on the Club’s terrace with my clients, Gretchen and Bill, who are moving to Chapel Hill from Ohio.This is their second trip to Chapel Hill, and we’ve narrowed down their search to Governors Club.They love the neighborhood located on on Edwards Mountain with the great views and Jack Nicklaus designed golf course. 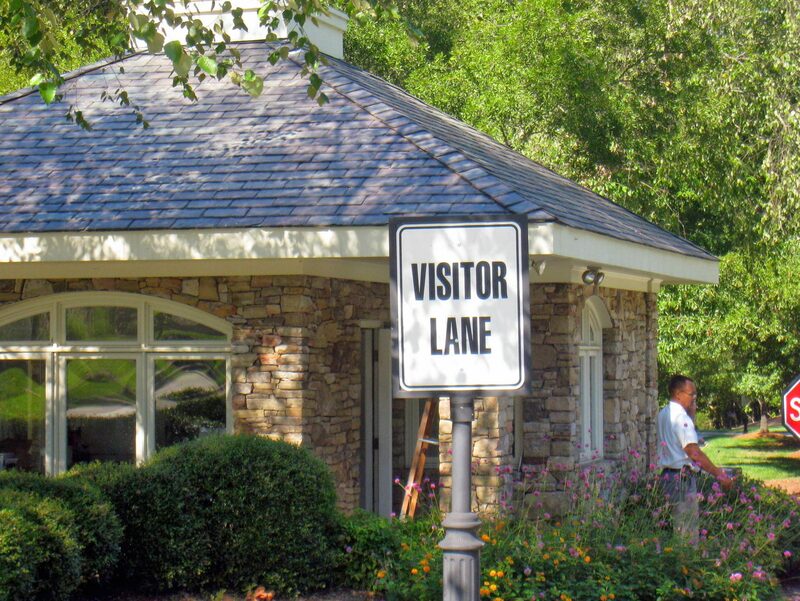 The gated community provides 24 hour security for peace of mind. Hi. I’m Marianne Howell Wright from Chapel Hill, North Carolina. Before deciding on one of the several homes they like best Gretchen and Bill wanted to visit with the clubs membership director and ask some questions about the facilities. They also wanted to visit with the tennis pro and check out the pool and fitness programs to make sure this was the right place for them. And because Real Estate is Hungry Work we had a wonderful lunch on the terrace overlooking the golf course. Governors Club is a gated community and they take security very seriously. As many times and as often as I’m in and out of the neighborhood, I always sign in and show my identification. We’re going to pull up now and say hello to Michele. “Good morning.” “Good morning.” The staff is really friendly in Governors Club. Our first stop is going to be the clubhouse, where we’ll meet with the membership director and then have lunch out on the terrace overlooking the golf course and then we’ll head over to the fitness center and pool and tennis facility. This is the clubhouse, we’re pulling up in front right now. Bill and Gretchen have questions for the membership director. Director: We’ve got the main dining room. Gretchen Mm-hmm, I like the dining room. And then, what’s that? That’s for like a private function room. Oh I think we did look out there. Like the ballroom and the boardroom and then the member’s lounge. Bill: So all the locker rooms are on this floor? Mm-hmm. I mean, yeah, this level. Mm-hmm. Sarah: Yes, the ladies locker room is located right to the left as well. Yeah. Good. Marianne: Sarah took us for a quick tour of the ladies locker room. It’s a perfect day for lunch out on the terrace, overlooking the golf course, the sparkling water, the sky was blue, the temperature was perfect. And the food was fantastic. Our waiter was really helpful. He took some video for us so we could all be in it. That’s Bill and Gretchen, the waiter and m,e and I’m going to zero in on the food right now: my shrimp salad, Gretchen had a pizza with artichokes and Bill had fish tacos. So after lunch I asked Bill and Gretchen to tell me what they thought about the houses that we’ve seen so far. So it’s our second day on this trip and are you as confused as ever? Gretchen Yes. We’ve narrowed it down, but confused between the ones that we have left. Marianne: Do you have an idea of which one you like? Gretchen: No. We’ve just seen the first one of the four again, and we’ll have to see the last three to make sure we’ve taken into account everything that is important to us. Bill: I think I want to get playing doubles some. Unidentified Speaker: Yeah. Doubles is much more popular. Bill: Yeah, that’s what I figured. Chantell: And then, so we have six play courts, two hard courts. They all teach lessons. I even teach lessons. Gretchen: How about the women? Chantell: We have women groups and then we also have clinics. Gretchen: OK. So if I’m just getting back into it there’s like a lower level? Chantell: There’s a beginner clinic in the morning and at night, that Tom teaches the one in the morning, Neil teaches the one at night. Chantell: They can get you fitted for the shoes and the racket and everything like that, so we can get you all set back up. Marianne: Chantell showed us around a little bit more. She was so energetic, she had me even wanting to join a class. Then we went on over to the clubhouse again to say goodbye to the membership director and thank her. Bill: We got some good information from somebody we talked to today about the tennis, so that was good. Chantell: OK great. And then how was lunch today? Bill: Oh it was great. Gretchen: It was delicious. We loved it, that was so wonderful. Gretchen: We had totally different things, and they were all wonderful. Yeah. It was real good. Marianne: Bill and Gretchen were happy with the club and the club amenities, so we were off to spend the rest of the afternoon revisiting their favorite homes. By the next morning, they had made a decision and picked a gorgeous house. They’ll be moving in just a few short weeks. This is Marianne Howell Wright, from Governors Club in Chapel Hill North Carolina.